Notes on Gettysburg Magazine, Issue 50, Cover Date: January 2014 arrived in the U.S. mail on Monday July 28. Over all, Issue 50 is not a military issue but is an historic character and contemporary author reflection issue. "The University of Nebraska Press is proud to announce that Professor James S. Pula of Purdue University will be the new editor beginning with Issue 50. He is currently accepting submissions for future issues." On A Great Battlefield: The Making, Management, and Memory of Gettysburg National Military Park, 1933-2013, Jennifer M. Murray, University of Tennessee Press, 2014, 312pp, notes, bibliography, index, 3 maps, 34 b/w photographs.$49.00. 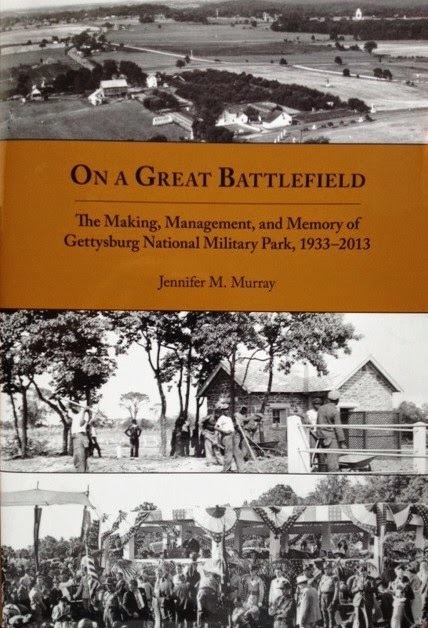 Certainly with 82 pages of notes and 14 pages of bibliography, Jennifer M. Murray was provided one of the very best studies of the history of Gettysburg National Military Park [NM]. The first chapter covers the first 70 years of the park. The next ten chapters details the 80 year span between 1993 to 2013. Murray, currently an assistant professor of history at University of Virginia's College at Wise is formerly a seasonal interpretative ranger during nine summer at at Gettysburg NMP. Of contemporary interest is the coverage Murray provides for the planning, the fundraising and the bitter controversies regarding expansive changes at Gettysburg. The public/private partnership to build the $103 million visitor center, the landscape rehabilitation, and the inclusion of exhibits presenting slavery, abolition, secession, Reconstruction and the Civil Rights Movement of the 1950s and 1960s in the visitor center may well be studied and redirect the mission, tasks and future of the National Parks Service and its historical parks. The final years of the 20th century and the first decade of the 21st century is viewed as a watershed era in the story of the park. Excepting the years between 1933 and 1940, when the park had available funds from the New Deal, no other era contained the degree of expansion and improvement to the battlefield. Eight of the 11 chapters focus upon the era of 1946-2013. Though initially a Phd. dissertation, Murray's narrative in On A Great Battlefield is clear, concise, cogent and accessible to the general reader. located within the grounds of Arlington National Cemetery. CWL, Explanatory Note: Arlington House, The Robert E. Lee Memorial is managed by the George Washington Memorial Parkway. It also manages the Clara Barton National Historic Site, the Clause Moor Colonial Farm, Glen Echo Park, Great Falls Park, Lyndon Baines Johns Memorial and the Theodore Roosevelt Island. 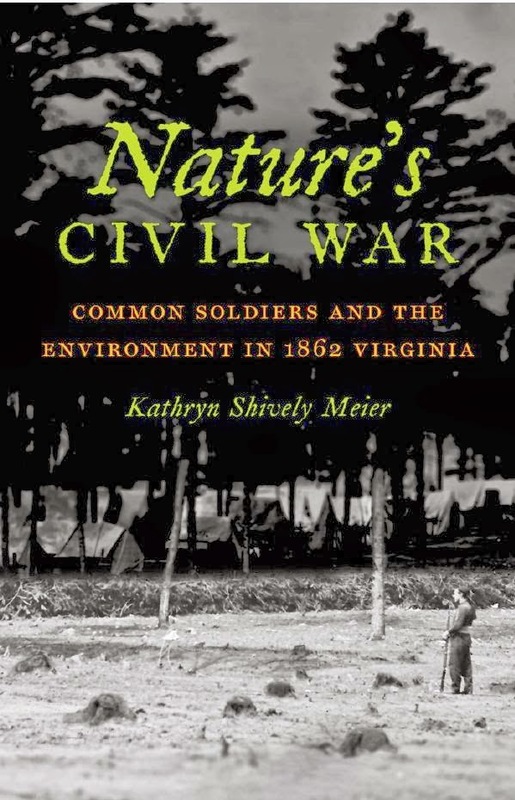 Kathryn Shively Meier’s Nature’s Civil War: Common Soldiers and the Environment in 1862 Virginia examines how troops on campaign challenged the marching, fighting and the natural environment when they sought to ruin the soldiers’ health. Meier introduces her work with a discussion of public health issues as understood by both Confederate and Federal soldiers. Both “believed nature to be a significant and sometimes definitive force in shaping their physical and mental health”. Sleeping, marching and preparing food out of doors made each of the natural environments challenging. Furthermore, typhoid, malaria, diarrhea, dysentery, rheumatism, scurvy, sunstroke, and a variety of emotional depressions were not limited to a single natural environment. Nature’s Civil War is both a medical history and an environmental history of eight months of military campaigns in Virginia. It offers the common soldiers’ perspectives on the environment and their feelings on how the natural environment is killing them. The Peninsula Campaign was fought in the midst of swamps and the Shenandoah Campaign was fought in what would appear to be a healthier environment of clear streams and rivers. The Shenandoah River Valley’s Eden is contrasted with the insalubrious swamps of The Peninsula. Readers may come to Nature’s Civil War with the notion that obviously the Shenandoah Valley must have been a great deal healthier environment than the Peninsula’s. The author finds that the 1862 Shenandoah Valley campaign that began in January with the Confederates marching to and encamping at Romney in the northern portion of the valley. The march was challenging to the Confederate troops’ health. On picket duty, soldiers froze to death. Mountainous terrain, quickly changing temperatures and weather, constant marching, and the general failure of Confederate logistics created health hazards during a season when foraging was less possible and self-care networks were not yet likely to be in place. Meier understands troops’ seasoning process to be lengthy, constant and complex. The author states that the Army of the Potomac in 1862 was the second largest city in the Confederacy after New Orleans and that the Army of Northern Virginia was twice the size of Richmond. The initial stage occurs during the first large encampment during which measles, chicken and small pox, mumps, whooping cough, and diphtheria assault the recruits. Meier intuits that urban recruits may indeed have become less sick from diseases than did rural recruits. A second stage occurs during campaign marching and battle. A third stage occurs after combat when burials of the battlefield dead, emotional shocks and melancholy rained blows on the survivors’ bodies and minds. Not in Meier’s Nature’s Civil War is a discussion of battlefield surgery; diseases not bullets were the primary cause of the 750,000+ deaths during the war. The book is social history; combat is not a topic reviewed here by the author. It is the time between the battles that is the focus of Nature’s Civil War. Meier describes self-care and how it was performed. It was very individualistic and was concerned with what may appear to today’s readers as mundane activities. 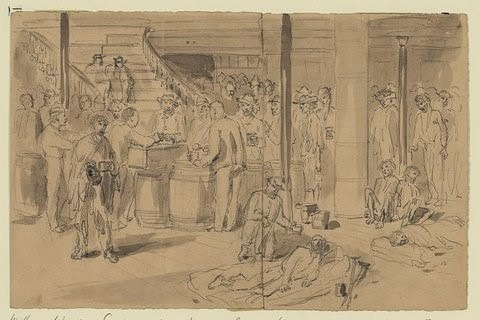 Soldiers sought to bath outdoors more frequently than ordered. Bad water was made drinkable by boiling it with coffee beans. Of course, the soldiers’ self-care methods engendered disputes with regimental surgeons and other regimental officers. Unaccustomed to professional care, the soldiers of 1861 and 1862 were suspicious and critical of medical services that followed regulations and disliked surgeons who were wary of enlisted men and thought them to be likely shirkers. One method of self-care included straggling which at times became an exercise to obtain vegetables and fruits. Straggling also occurred when soldiers believed that they needed rest in order to recuperate from long marches performed in staggering heat or drenching rain. Increased spiraling upward rates of sickness and poor morale frustrated commanders during the 1862 Shenandoah Valley and Peninsula campaigns. During these campaigns, officers as well as enlisted men developed personal health communities that included wives visiting camp and African American servants. Concerns relating to cooking out of doors, finding clean water, and protection from inclement weather were constant. Fevers, fleas, flies, and frostbite were just a few of the medical concerns which were addressed by self-care networks. At the heart of Meier’s book is a sample of soldier letters, diaries and memoirs from winter 1861-1862 through mid-August 1862 created by 205 individuals. The author reinforces this sample by consulting The Medical and Surgical History of the War of the Rebellion, Outlines of the Chief Camp Diseases, the regulations of the Confederate army, the papers of the U.S. Sanitary Commission and other documents. One of her several goals for Nature’s Civil War is to serve as a reminder to military historians to “look beyond the battlefield to understand fluctuations in morale”. Though beyond the mid-August 1862 limit of Meier’s book, an historian who dwelt upon this issue is Joseph L. Harsh. His trilogy, Confederate Tide Rising, Taken at the Flood and Sounding the Shallows are studies of Robert E. Lee’s strategy, tactics and his troops’ deteriorating health during the 1862 Maryland Campaign. In The Life and Billy Yank and The Life of Johnny Reb, Bell I. Wiley established a field of Civil War literature that places the voices of the soldier in the forefront. Throughout the Meier’s Nature’s Civil War the words of the soldiers are frequently offered and readers may be reminded of Wiley’s legacy. The bibliographic resources of Nature’s Civil War: Common Soldiers and the Environment in 1862 Virginia are numerous. Nature’s Civil War: Common Soldiers and the Environment in 1862 Virginia, Kathryn Shively Meier, page 2. This review first appeared in The Civil War Book Review [Spring 2014] published by Louisiana State University. News--Underwater Wreck Reveals Covert Weapons Deal Between UK And CSA. New Historical And Archaeological Research Is Shining An Embarrassing Light On One Of The Darkest Periods Of British Foreign Policy, David Keys, The Independent, June 25, 2014. Investigations by a leading Scottish maritime historian have succeeded, for the first time, in locating the main secret British headquarters of the American Civil War Confederate government’s transatlantic gun-running operation. Other research, carried out over the past decade, has revealed the extraordinary extent to which substantial sections of Britain’s business elite were working with impunity to help the slave-owning southern states win the Civil War – despite the fact that Britain was officially neutral and had outlawed slavery almost 30 years earlier. 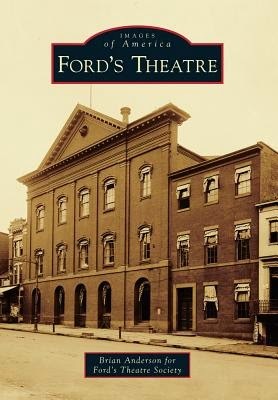 Ford's Theater: Images of America Series, Brian Anderson, Arcadia Publishing, 128 pp., profusely illustrated, $21.99. Clear and concise pictorial history of Ford's Theater, Washington, D.C. Full of events and personalities other that April 14, 1865 and Lincoln. Covers the 1839 to 1859 construction of the building and its use as a church, The building's use as a theater from 1861 to 1865 reveals the social and entertainment life of DC during the war. It served as an office building and warehouse from 1866 to 1932 when it became a museum. The transition from museum to a museum/theater/educational complex is intriguing. and reveals that the management of the site has been thoughtful in response to the demands of the market and real estate values. A fine book for public history students and those interested in the history of Washington, D.C.
Civil War Trust To By Lee's Headquarters, Amy Worden, Philadelphia Inquirer, July 1, 2014. For almost a century, the small, historic stone house on Chambersburg Road has been obscured by the commercial buildings surrounding it. But in 1863, it occupied a prominent position at the epicenter of fighting on Day One of the nation's best-known Civil War battle. That night, it would be seized and used as the headquarters of Confederate Gen. Robert E. Lee. On Tuesday - exactly 151 years after the start of the Battle of Gettysburg - the Civil War Trust will announce the purchase of the four-acre parcel and the restoration of the site to the way it looked in 1863. "As far as preserving a historically significant structure and part of the battlefield, this is biggest deal we've ever done," said Jim Lighthizer, president of the Civil War Trust, a Washington-based nonprofit group that has preserved 40,000 acres of land in 20 states. 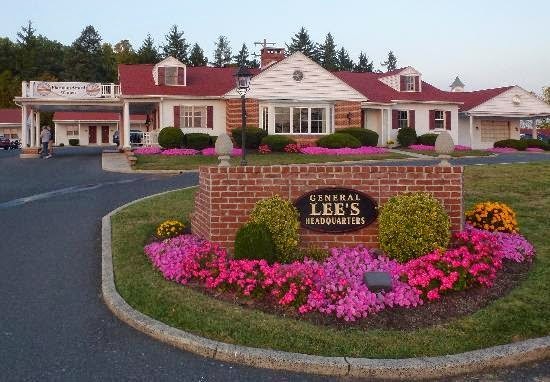 "Lee's headquarters is one of the most important unprotected historic structures in America." Lighthizer said the trust would purchase the property, which includes a Quality Inn and a brew pub, from Belmar Partnership for $5.5 million and spend an additional $400,000 to $500,000 to demolish the modern structures and restore the historic building. The house, believed to have been built in 1833, was occupied by a widow named Mary Thompson at the time of the war and was co-owned by U.S. Rep. Thaddeus Stevens - a force behind the passage of the 13th Amendment ending slavery. The headquarters building was opened as a museum in the early 1920s in connection with the motel on the site. Lighthizer said the artifacts, which were to be donated to the trust by the owners, would be sold and the building restored to the way it looked when Lee and his officers plotted strategy under its roof. Lee would go on to defeat July 3 and retreat south after losing thousands of men in what is considered the turning point of the war. "This spot is where some of most important decisions were made by an American general in the Civil War," said Lighthizer. "It had direct impact on the future of the country." He said that there was no timetable for the restoration project or reopening the house after demolition of the modern buildings, but that the whole parcel would be donated to the National Park Service for inclusion in the Gettysburg National Military Park. "To the preservation community, this land was long considered lost," Deputy Secretary of the Interior Mike Connor said in a statement. "Thus, the journey we embark upon today is especially meaningful: We are not just protecting a piece of American heritage, we are reclaiming it for future generations."